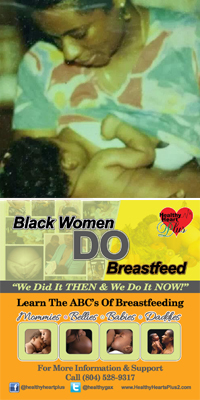 Mommies, Bellies, Babies, and Daddies was created to inform new mothers about the importance of breastfeeding, nutrition during and after pregnancy, and combating the infant mortality rate in minority communities. 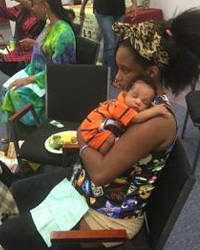 The group is a sister circle where young mothers can come and discuss not just their needs for pregnancy, but also their personal challenges. It is also designed to educate and empower mothers with the ABC’s of Breastfeeding for them to appreciate themselves, Bond with their baby, and become a better Caretaker of self and baby. Besides reducing the infant mortality rate, there are additional program goals including: reducing low birth weight and racial disparities by addressing associated risk factors, reducing maternal stress and depression, and increase breastfeeding rates. There have been several guest speakers brought in to inspire and encourage the young women. We’ve discussed everything from domestic violence to furthering education to the importance of voting, as well as and how it will apply to both Mommy and Baby. Healthy Mommies are very important to us so we also discuss fitness and good nutrition. For Babies. Prenatal and Postnatal Care are also provided to support Mommy and Baby for as long as they feel they need it. This class is held every other Monday twice a month and the time is from 3-5pm. This upcoming parenting class will be designed to provide basic parenting skills such as how to cope with sleeping, potty training, self ​esteem, positive discipline, child development, and etc. This program will create a parenting circle where parents can gain support and encouragement, and talk about their issues. We will offer guest speakers from local resources to help them become better parents. When attending these classes it will empower parents to become self-sufficient, knowledgeable, and aware of what’s to come of being ​a new parent. Times and dates are TBD. 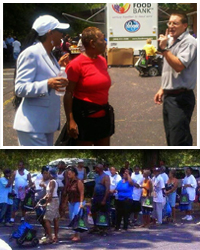 The Central Virginia Food Bank’s Mobile Food Pantry Program has been serving the Richmond community since October 2009. 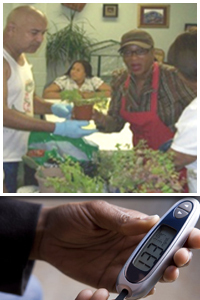 It was designed to decrease hunger within the community on a nutritional level base on the individual’s needs. This program has improved the lives of those who are homeless and struggling to make ends meet. The program takes place in 4 locations: Vernon J. Harris, Whitcomb Court, Chester, and Petersburg. The food pantry serves an average of 500 people at each site; this number is steadily rising. Petersburg distributes on the 1st of every other month, Vernon J. Harris is on the 2nd of every other month, Chester ​is on the 3rd of every other month and Whitcomb Court is on the 4th of every other month. Each site operates between 12-2pm for distribution. Call for more information.